Hey, I just found a new blog (Stocking the Dungeon) and noticed it's dedicated to campaigning in my old favorite, Mystara. These days we are strong with the power of AD&D and Greyhawk, running a campaign featuring all the classic AD&D modules, but I spent most of my DM career campaigning in Mystara. 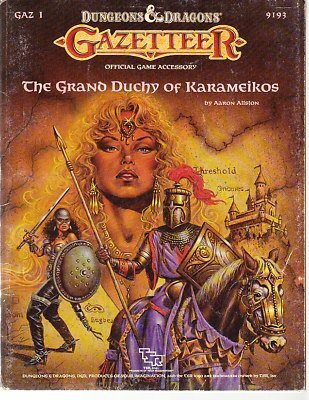 For many years, the Grand Duchy of Karameikos was always the starting place for new campaigns. Mystara tends to be overlooked by the old school crowd, folks that got their start in the 70's and early 80's; by the time Mystara was hitting its stride, they had checked out of TSR and its 2nd Edition and its death from a thousand settings. 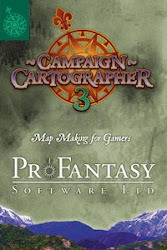 Mystara followed the pattern of the time, releasing book after book after book, describing all the nations of the Known World in Gazetteers, the Hollow World, and something I can only describe as RACE CLASS MADNESS (in other words, those four Creature Crucible books and Orcs of Thar). But while many of the TSR settings of the 2E period went for different flavors of theme and simulation, like Al Qadim or Kara Tur or Maztica or The Horde, Mystara saw that, raised them, and then went gonzo. As in, "the moon is ruled by katana-wielding Cat People Samurai Ninjas, who ride giant saber tooth tigers, in space." That, my friends, is either stupid, or awesome. Or as Jeff might say, stupidly awesome. This is what happens when you're the red-headed stepchild of AD&D. The suits ignore your product line, and you're given freedom to have some fun. Basic D&D is for kids, right? Sit tight and see what happens when the inmates run the asylum. First off, Mystara kept Dave Arneson's Blackmoor firmly in the setting's prehistory (for those that wanted some time travel, there was the opportunity to jaunt back to the Temple of the Frog or visit the Egg of Coot in the DA series of Blackmoor modules for Mystara). The good ship FSS Beagle crashed on Mystara, and its nuclear reactor exploded, destroying the ancient world of Blackmoor and turning the globe into a prehistoric nuclear wasteland. All magic on Mystara is fueled by low levels of background radiation, and the existence of magical creatures can be traced back to magical mutation. The first step to awesoming up your setting is putting a global thermonuclear catastrophe in the ancient past and declaring that magical races (elves!) are actually unwitting radioactive mutants. In the Glantri book, there are even ways for wizards to learn how to manipulate radiation-magic directly (it's called The Radiance) and a practitioner will either become immortal or get turned into a Lich suffering from radiation sickness. But don't worry, the 20th level wizards wasting away into radioactive Lichdom fit in with all the vampire wizards and werewolf wizards in Glantri. It's a party. Too much manipulation of the Radiance can actually alter the flow of magic on Mystara, causing Potions of Longevity to fail and magical creatures (elves) to slip into lethargy. Before I forget - a little Clark Ashton Smith makes any setting better, so those whacky Mystaran writers transplanted the whole crew from Averoigne right into Glantri by way of Castle Amber. I love the fact the Enchantress of Sylaire graces the cover of the Glantri book. The Mystaran sky is filled with various nations that have mastered air ship technology, like the expansionist Heldannic Knights of the Heldann Freeholds, or the Alphatians, descendants of the Atlanteans of Earth myth. The Alphatians went on an inter-dimensional odyssey before ending up in Mystara... every setting should have ties to sunken Atlantis. We learn that Alphatia is ruled by a council of no less than one thousand 36th level wizards. If "magic as technology" isn't your thing, you might be annoyed by Mystara. There are flying carpet courier services, islands set up as theme parks for ordinary folks to experience "the adventurer lifestyle" on holiday, and Glantri City is lit by continual light spells. An entire kingdom of gnomes floats high above the ground in their orbiting clockwork city of Serraine. In case the surface doesn't have enough wahoo, consider that Mystara is hollow. There are huge voids at the north and south pole where an explorer could literally walk around from the outside to the steaming jungles of the inside world, but powerful divine anti-magic prevents flying ships from making the trip. The hollow world is a night-less place where the immortals of Mystara transplant dying cultures in a kind of world-sized bottle city; it's filled with analogs of the Aztecs (with dinosaurs), the Romans (with dinosaurs), and the Egyptians (with dinosaurs). One of the hollow world deities is Ka, the patron god of dinosaurs, so the place is crawling with prehistoric monsters and the scantily clad barbarian princesses that ride them. It's ideal for a savage world, swords & sorcery style game (with dinosaurs). I mentioned that Mystara featured RACE-CLASS MADNESS. It's what happens when you can't resist the urge to turn any monster or humanoid race into a playable class. I mean "Pegataurs", really? Mystara took the Elf, Dwarf, and Halfling classes, as laid out in Moldvay BX and Mentzer, out to its logical conclusions. There are race classes covering every type of lycanthrope, lots of woodlands creatures (centaurs, pixies, sylphs, dryads, satyrs, and more), all manner of aquatic races, and every kind of monstrous humanoid. One could even run an entire humanoid campaign centered on the monster realms in the Broken Lands - wouldn't it be fun to visit Trollhattan, or Bugburbia? Mystara didn't take Gygax's "humanocentric vision" very seriously, and enjoyed plenty of in-jokes. 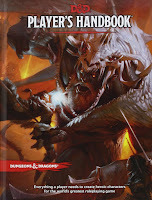 In addition to stretching the bounds with gonzo weirdness, the D&D line featured products that took classic D&D out of the dungeon and added new dimensions to game play, like mass combat, domain rulership, and quests for immortality. 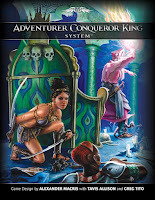 I haven't been shy about talking up my support for Adventurer Conqueror King, especially because it's improving the systems first field tested on storied Mystara. The story line that was begun in X4 Master of the Desert Nomads and X5 Temple of Death reaches fruition in module X10, Red Arrow, Black Shield - a double sized adventure that plunges Mystara's Known World into a continent spanning war against "The Master" and his desert hordes. It's really two games in one, first a series of player character quests as the players traverse the Known World as envoys enlisting the kingdoms of the world to rise up against the Master. It's also a continent spanning military campaign using old school hexes and cardboard military counters to track the progress of a war spanning dozens of nations and hundreds of army units. Domain rules are fully embraced in C1, Test of the Warlords, which opened up the Norwold region of Mystara for colonization, allowing your 15th+ level PC's to carve out wilderness domains, raise armies, and hold off various invasions. Norwold would go on to be a mainstay in the M-series of modules as well, and thrust the players right into the middle of the conflicts between Thyatis and Alphatia, the world-spanning empires on Mystara. I'm going to skip discussing Mystara's approach to Immortals and quests for Immortality, seeing as this Ode to Mystara is waxing long. Wrath of the Immortals was a boxed set that put this element of play front and center, and probably deserves it's own post at some point (it's both ambitious and controversial). Suffice it to say, Mystara's approach to integrating gods, known as "Immortals", was just was wahoo as the rest of the setting, centering Immortal politics around a location on the moon known as the Vaults of Pandius that's presented a bit like the halls of the Justice League. The game I play every other Sunday is based in the Known World, although we are using Pathfinder rules. And the campaign is a sequel of sorts to the first campaign we played as a group, running through all the classic Known World modules. Great fun, and a truly mad setting. Survived Castle Amber, led an army on a flying ship, and dealt with the weird wizards of Glantri (which is where we are heading next). Good post. I'm a fan of the Mystara setting myself. In some ways, its almost the perfect blend of standard D&D-isms and weirdness. Let me amend that: it may be the best commercial example of what the archetypical "good" D&D setting should be like. Mystara is awesome and I love the Gazetteers (even the bad ones) for embracing the gonzo free-style of the setting. There're still great ideas and truly original stuff hidden there, sadly forgotten by most D&D players (and Orcs of Thar is one of the funniest books ever written). ...the moon is ruled by katana-wielding Cat People Samurai Ninjas, who ride giant saber tooth tigers, in space. This would be Mystara's second moon, the invisible one? Bruce Heard's "Voyage of the Princess Ark"/"Known World Grimoire" series of articles did some excellent in-fill work after the Gazetteer line got canned. Personal favourites included the kingdom of split-personality shape-shifting spider people, or the land of the dead where everything was based on a trade in souls, or the Scorpion Men who - despite suffering horrific sunburn - had their own ancient Mesopotamian culture going on. Yep - I just remember there were two moons - one a lifeless chunk (where the gods have their city in a crater - reminds me of the Inhumans in Marvel Universe) and the other one is home to Myoshima, the empire of the samurai cat people. Mystara is what happens when you play the improv YES, And... game for a steady 10 years or so. "Yes, And wouldn't it be cool if those cat people could ride sabre tooth tigers... in space?" great post, not that sounds like some great material that someone should OGL back to life! Mystara was my world for years. I merged it with Greyhawk in high school and it is the world I am still using today.